The outlook for the S&P 500 in 2017 is probably not as rosy as the post Trump rally would suggest. The sentiment around the increased profitability of US companies with the corporate tax cuts is somewhat misguided. 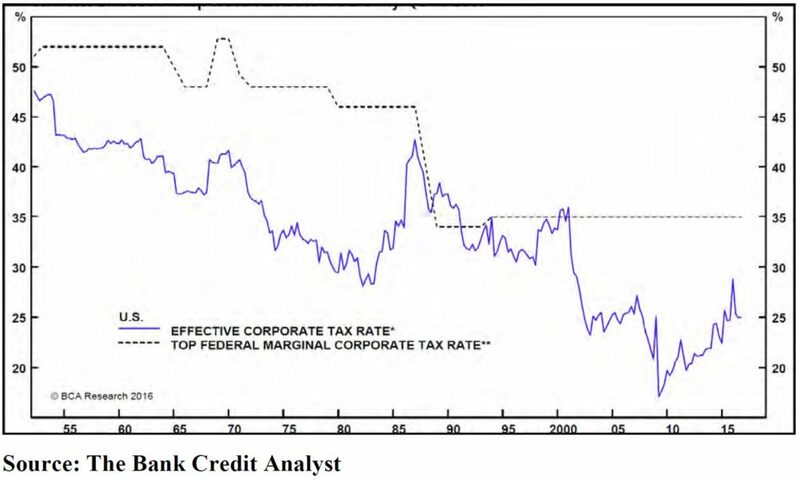 According to data prepared by the Bank Credit Analyst, the effective tax rate of US corporations has average about 25% for the past decade versus the official marginal rate of 35%. To be sure, if more corporations bring back their profits to the US instead of leaving them in foreign jurisdictions, there will be more capital available for dividends and share buybacks, but that is just not real earnings per share growth. And that is not going to boost earnings much just on the tax gains. Expectations from the bottom up analysts forecasts for 2017 earnings growth is a whopping 22% according to some surveys. We have $106.80 in trailing earnings and the market is looking for over $130 for 2017, which makes the forward multiple at 17.4x not expensive versus the current 21.3x, which is very expensive. The question to ask is that in a 3% GDP world with the strongest dollar in decades, can we see 22% earnings growth. Gee Larry, when you say it like that it sounds rather ridiculous! Looking at where the biggest source of earnings growth will come from, we need to look at what companies have lead the post-election rally. It’s clear the banks (Goldman Sachs, JP Morgan) that will benefit for deregulation (and a steeper yield curve) have lead the way while the companies that sell products globally like Proctor and Gamble and Coca-Cola are amongst the worst. The 12-month forward average analyst target for GS is $240 (it closed last week at almost $245). It would seem lots of good news is already priced in. 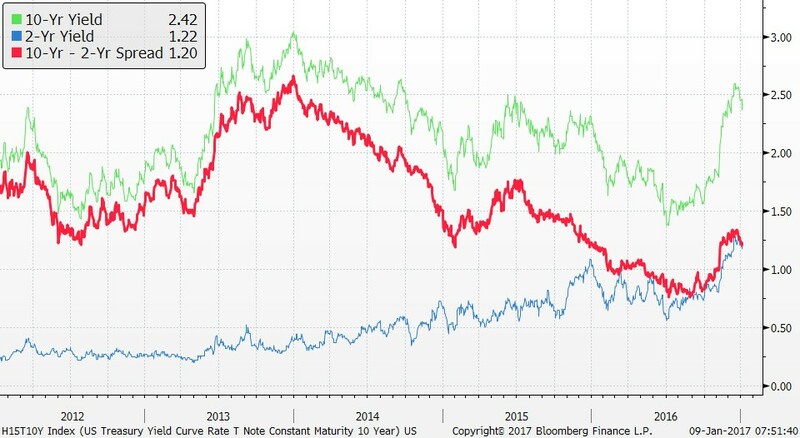 A quick look at the yield curve offers a dose of reality on how much difference that curve will make to earnings relative to the last 5 years—NOT MUCH is our conclusion. 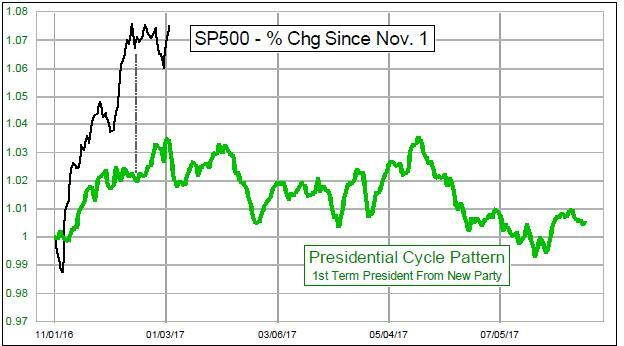 Looking at the average return for the S&P 500 for the first year of a new President from a new party and we see that it’s about zero on average. There are several things lining up to suggest a challenging year ahead. In a market that may be overvalued and may not see the growth that is already priced in, one of the best ways to play the market is with options. Selling (writing) a put on the S&P 500 ETF may be the best strategy to get exposure to the US market next year. 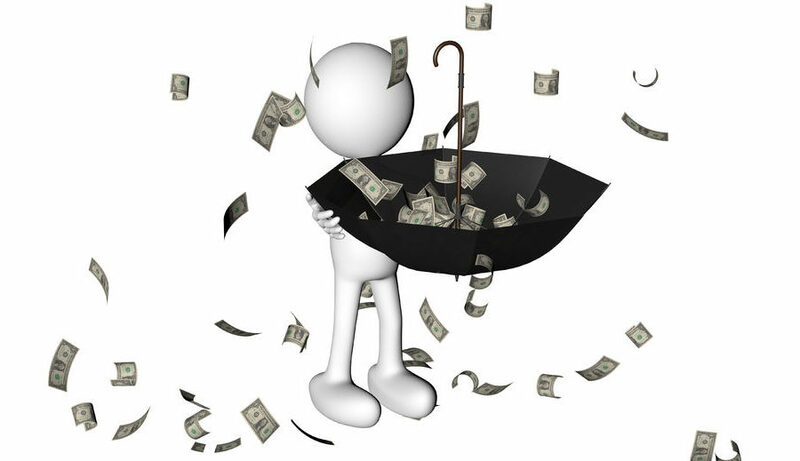 Writing a put option gives you the obligation to buy the underlying at the strike price at expiration. The SPY ETF is currently trading at about 227 and will yield about 2% dividend in 2017. A 10% market decline would put the strike at 205. Writing the Jan 2018 205 put yields about $7.81 or about 3.4%. The table below can be used as a guide for where the yield versus the downside protection would be attractive to you. I love the idea of using options to take positions when the market risk versus return is unfavorably skewed. Learn how to use techniques like this and how to be a smarter investor in our 7th season across Canada speaking tour. Free registration at www.investorsguidetothriving.com. Help us raise money to fight Cancer and Alzheimer’s by making a voluntary donation with your registration. Over the past few years, Berman’s Call roadshows have raised over $200,000 for charity thanks to sponsors and BNN viewers!